Be alert and listen for instructions from your local community emergency response center. Before you go back to your home after a flood you need to check for structural damage. Do not turn power back on until an electrician has told you it is safe. If your vehicle has been involved in the flood then be aware that you can not trust it to function correctly. The water supply can be affected so boil your water or drink bottled water. You need to mitigate damage. 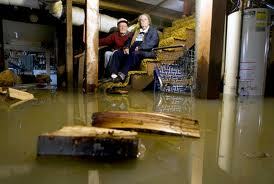 If your basement is flooding then remove the items that you can probably salvage. Try to get out items before they are immersed but only if it is safe to do so. When you start the clean up be careful to protect yourself. Wear boots and gloves when cleaning and disinfecting. Items that have been immersed in water should be cleaned with bleach and then allowed to fully dry out. Limit the mold damage by removing wet contents as fast as you can. Take pictures. It will help you in the process of listing what has happened and a picture is truly worth 1,000 words in a claims situation. Start making a list of what has been damaged or lost. Estimate the date of purchase and what you paid for it. Try to find receipts to match the items. Do not throw anything out until you have been advised to do so. You may need to prove the damage. Have an emergency kit ready to provide for you and your family.